UK Stoves was originally a start-up spin off from the KG Smith & Sons coal merchant business, focussing on retail of wood burning and multi-fuel stoves. With the first website created in 2007, they now have evolved to their 3rd website, launched in 2015, which is a modern, fully responsive ecommerce website, one of the top websites in their sector in the UK. Freetimers has assisted with branding and logo development from the outset. Starting initially as a brochure website with a product database, this has been gradually expanded, with the public site now being fully ecommerce and responsive, a banner and promotions system, Live Chat, related products, and a complex product filtering system that greatly improves user experience (ux). In addition to the website and database, the client can also use our online management system to manage the website's content using our CMS as well as more than 30 other modules, allowing administration of menus, filters, banners, brands, bulk email, bundles and offers, products, categories, options, inventory, customers and orders, and more. The system has also been progressively customised to help improve/streamline business processes and customer communications. 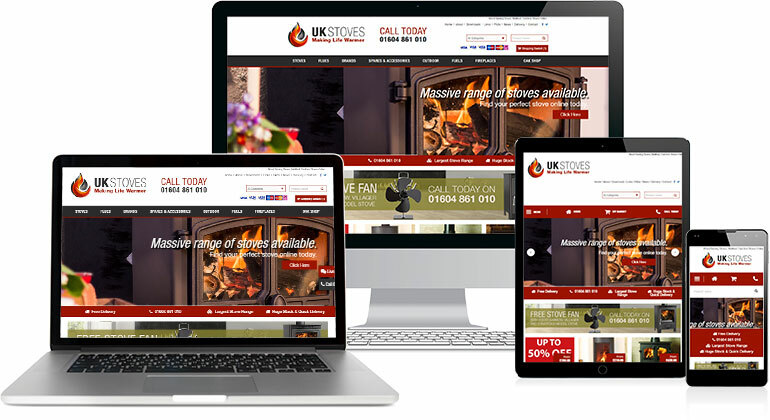 We also undertake and manage a number of online marketing services for UK Stoves, including search engine optimisation (SEO), content, social media and email marketing. For SEO, the site is currently the Google No 1 for its two most important search phrases, 'multi fuel stoves' and 'woodburning stoves'. We also optimise for more than 500 search phrases, with 337 in the top 10 positions, 269 in top 5 and 117 Google No 1s. Site visitors have increased nearly 300% since 2012.